Grappa originated in Italy among the poor folk who would use the left-overs from the production of fine wine to make it. Winemaking left-overs basically meant the skins, pulp, seeds and stems (known collectively as the pomace) from grapes that were then fermented. It is unknown when the first grappa was distilled but there is evidence that it originated in the foot-hills of the Alps in northern Italy around the mid-14th century. By the end of the 15th century it was firmly established, being both licensed and taxed in Italy. Today, to be called grappa, the product must be made in Italy, or in San Marino or the Italian part of Switzerland; it must be produced from pomace; and, the fermentation and distillation must occur directly on the pomace with no water added. 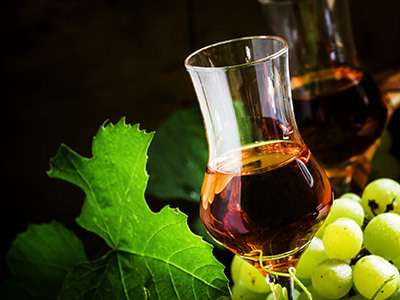 Thus grappa cannot, like brandy, be made from grape juice and, since distillation must occur on solids, steam distillation is typically used to avoid burning the pomace. 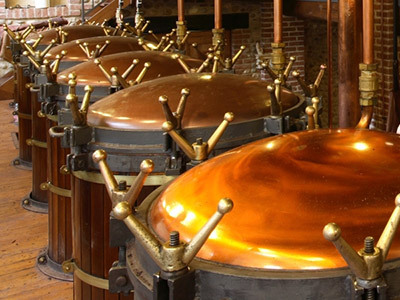 The modernization of grappa distillation is relatively recent, and refinements include the distillation of pomace under vacuum, the use of varietal grapes, and aging in casks of various types of wood to enhance and smooth the flavor of the spirit. J.A.B. utilizes the pomace from three different Piedmontese grape varietals to produce its grappa: Moscato, a white grape, and two red grapes, Nebbiolo and Barbera. The Moscato, or Muscat, family of grapes includes over 200 grape varieties that have been used in wine production and as raisin and table grapes around the world for many centuries. Moscato grapes and wines almost always have a pronounced sweet floral aroma. The breadth and number of varieties of Moscato suggest that it is perhaps the oldest domesticated grape variety. Theories about its origins date its ancestors to the ancient Egyptians and Persians of early antiquity (c. 3000-1000 BC) while some believe that they were propagated by the Greeks and Romans of classical antiquity (c. 800 BC to 600 AD). Nebbiolo, or Nebieul in Piedmontese, is a red wine grape variety predominantly associated with its native Piedmont region, where it makes the DOCG wines of Barolo, Barbaresco, Roero, Gattinara, and Ghemme. Compared to the annual growth cycle of other Piedmontese grape varieties, Nebbiolo is one of the first varieties to bud and the last variety to ripen, with the harvest taking place in mid to late October. In some vintages, producers are able to pick and complete fermentation of their Barbera plantings before Nebbiolo is even harvested. 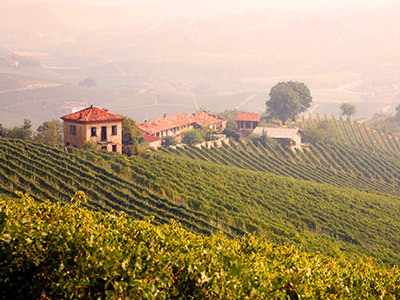 Nebbiolo produces lightly-colored red wines characterized by their ample amounts of acidity and tannin. As Nebbiolo ages, the bouquet becomes more complex and appealing with aromas of tar and roses being the two most common notes. Other aromas associated with Nebbiolo include dried fruit, damsons, leather, licorice, mulberries, spice, as well as fresh dried herbs. Barbera, another red Italian wine grape variety that is the third most-planted red grape variety in Italy, is believed to have originated in the hills of Monferrato in central Piedmont where it has been known from the thirteenth century. 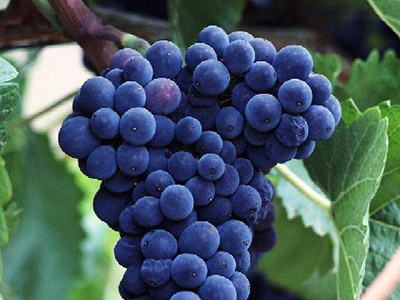 It produces good yields and is known for deep color, low tannins and high levels of acid. Centuries-old vines still exist in many vineyards and allow for the production of long-aging, robust red wines with intense fruit and enhanced tannic content. In Piedmont, the Barbera vine is prized for its yields and ability to ripen two weeks earlier than Nebbiolo. This allows the winemakers to give their best sites over to the more difficult to cultivate Nebbiolo and still produce quality wine with Barbera. To produce J.A.B. 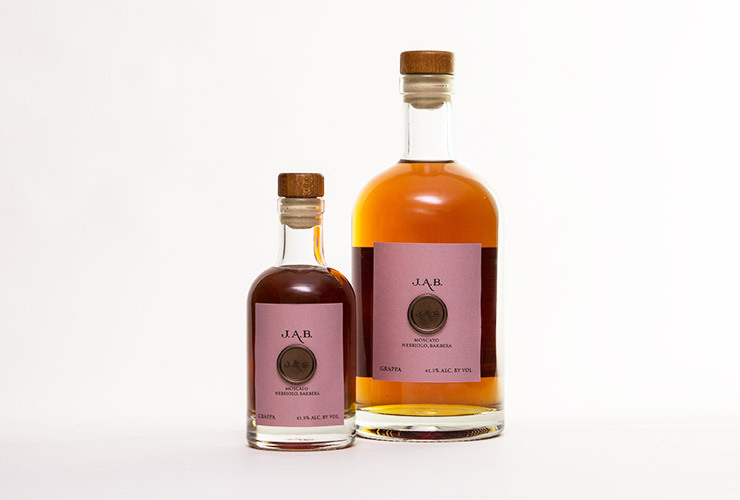 Moscato, Nebbiolo, Barbera grappa, the pomace remaining after the separate fermentation of the three grape varietals is distilled individually, after which each distillate is placed on its own in Slovanian oak casks for two years of aging. Following this , the three aged distillates then come together for the first time when blended and further married by an additional six months of aging in limousine oak barriques, giving the final product its reddish-brown color. In Italy, grappa is traditionally served by itself at room temperature or slightly chilled as a digestivo or after-dinner drink to aid in digestion. Grappa is also sometimes added to espresso coffee to create a caffe corretto. Another variation is the ammazza café (“coffee killer”) where the espresso is drunk first followed by a few ounces of grappa served in its own glass. Still another variation is the resentin (“little rinser”) where after finishing a cup of espresso grappa is poured into the nearly empty cup, swirled, and drunk in one sip. However you choose to enjoy J.A.B. Moscato, Nebbiolo, Barbera grappa, you will be pleased by this singularly rich and mellow expression of a traditional grappa, with its intense complexity, smooth taste, and well balanced wood notes.